Learning extends beyond the halls of your high school and the boundaries of your city or hometown. One potentially great way to expand your horizons before you earn your diploma and decide where to attend college is to study abroad in high school. Many students who choose to participate in high school study abroad programs do so during their junior year so as to not miss out on the many events that occur during the senior year. There are a variety of different programs ranging from summer volunteer opportunities to spending the entire academic year in another country. This potential opportunity provides students with the chance to make lifelong friends, memories, and experiences to support them throughout the rest of their lives. 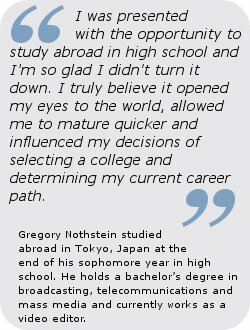 Why Study Abroad in High School? There is a vast array of potential benefits to participating in study abroad programs for high school students. High school abroad programs may provide life experience, enhanced perspective, language skills, and the opportunity for personal development. When applying to college, graduate school, or even pursuing a career, adding a study abroad experience to your resume may be a great way to enhance your profile. Essentially, choosing to study abroad provides you with an experience that you would otherwise not be able to have at home. While there are many study abroad high school programs, we understand that not everyone is keen on spending an entire academic year abroad. That’s why there are so many different kinds of programs. If you do want to spend your junior year abroad, then there are high school abroad programs for that. If you would rather spend your academic year at home, then try researching the study abroad high school summer options. Not every program is necessarily academic-related. There are service opportunities as well. If all you want is to learn a foreign language, then look for intensive language study programs. Once you know how long you want to stay and what you want to get out of the experience, all you need to do is find the program that meets your needs. Study abroad does take a bit of preparation. It’s important to make the decision to participate in a program early on so you have plenty of time to get ready. Starting about a year before you plan on leaving should be enough time. Be sure to meet application deadlines and understand what is required of you throughout the program. It is a good idea to have an understanding of where the program is sending you, what sort of accommodations are available, and what to do in an emergency situation. Many high school programs arrange for host families to house students and have guidelines on the amount of contact with family at home. Make sure to understand these guidelines early on. There are a variety of programs to suit different budgets, so research carefully to find one that meets your needs. Creating a budget and savings plan long before your departure date should also help. In addition to program costs, don’t forget about leisure money to spend on souvenirs and fun activities. Chances are good that you won’t regret choosing to go on study abroad in high school. If you’ve already graduated, the good news is that there are plenty of potential study abroad options for college students and volunteers as well. Get started on this experience of a lifetime by researching the programs below, or refer to our Resources section for additional information. Our Facilitators are very knowledgeable and highly experienced. IVY League Academy provides world class education with Day boarder, Weekday boarder and full boarder. A complete school from I – XII with CBSE Syllabus. Sea turtle biology; coastal and rainforest ecology; conservation biology; data collection and project design; exchange with local participants; beach exploration; hiking; whitewater rafting; restoration projects and much more! Are you a Canadian high school student interested in learning a new language or experiencing a new culture? Then we have the program for you! Study in Japan, Australia or New Zealand for 5 or 10 months. •	Hospital work experience •	Shadowing dentists •	Personal mentors •	Small student groups •	Global health tutorials •	Exclusive housing •	In-house catering •	24/7 In-Country support •	and more! Study Abroad At the First and Only Non-Profit College in China!